The boys' lacrosse team show some real fortitude at Mt. Vernon this week. English II uses a March Madness theme to evaluate poetry. Abby Sklar (‘18), a 12-year day student at Darlington, and her mother, Lauren Sklar, reflect on the Darlington experience and their support of The Darlington Fund in the Q&A below. Originally from Rome, Abby is now a freshman political science major at Boston University. Here's a look back at some great new books that I have read so far this year that I recommend to others. Earlier this year I traveled with 14 students from my AP Human Geography and International Law classes to Atlanta, to attend a luncheon and lecture hosted by the Atlanta Council on International Relations where we had the chance to hear from Vietnam War veteran Colonel John Clark, USAF (Ret. ), an American hero. 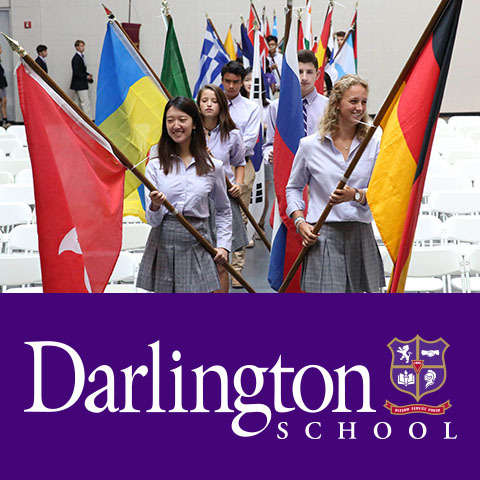 I am excited to announce that Darlington will be expanding its offerings in the world language department beginning with the 2019-2020 school year. Fine Arts Takes New York City! Art history and journalism students recently had the opportunity to travel to New York City and learn about the arts. Darlington Fund Grandparent co-chairs Sylvia Lanier and Ansley Saville ('69T, LD '18) share their personal testimonials about the impact Darlington has had on their lives and why they support The Darlington Fund. I am so proud of how Darlington fine arts students are sharing their passion and performance in the community. Thanks to the Thatcher Faculty Development Fund, I had an opportunity to learn more about personalized learning at the Future of Education Technology Conference (FETC) in Orlando, Florida. Soon after rejoining the Darlington Community, I learned that I would be attending a conference in Philadelphia. Aside from attending the conference, I also had the privilege of connecting with an impressive former student, Mr. Austin Spooner (’12). Parent of Alumni Chair, Lynn Whatley ('67, LD '15), shares why he gives to The Darlington Fund. This past week, Valentine’s week, I traveled with three other coworkers on the Darlington annual middle school trip with the seventh grade. I recently had the opportunity to go to the Future of Education Technology Conference (FETC) in Orlando, Florida, thanks to the Thatcher Faculty Development Grant. Darlington School is delighted to announce an exciting program for our rising seniors. Senior Ventures is a bold plan, built on the belief that our senior class has the vision and the determination to accomplish great things. Our development committee of faculty and staff is seeking an inaugural cohort of 5-10 seniors to lead our student body with their commitment to community leadership. I attended the NCTE conference in November, and it was amazing! I'm grateful for the Thatcher Professional Development Grant which made it possible! It is with sadness that we share with you news of the passing of Gardner Wright, Class of 1947, 2013 Distinguished Alumnus and Life Trustee. Gardner was the Darlington Tiger we all strive to be. RUMPUS is upon us and our Upper School students are crazed with amazing house themes, long rehearsals, elaborate costumes and all of the excitement that comes with this annual tradition. Since starting as the new director of GOAL in July, I have seen the amazing impact the Georgia GOAL Scholarship Program has on students at Darlington School. Thanks to the support of our contributors, Darlington was able to provide 67 students with GOAL Scholarship funds this school year!